Participants celebrated the Frontera by printing their own radical patch on fabric. 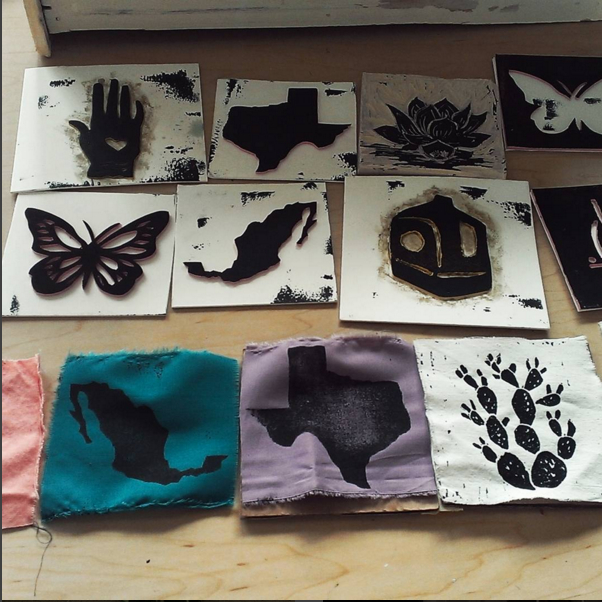 Folks chose from pre made blocks inspired by images from the Texas-Mexico Border landscape and explored using block printing tools such as brayers and water-soluble inks. Participants left with a 4”x4” one color print patch, a mini portfolio to store the patch, and a hand out about block printing. Participants delved into the magic of plant chemistry and extracted a rainbow of colors from nature. Folks explored the creative potential of natural dye inks and made mark makes with flower stamping techniques. Participants learned how to mix inks from natural plant materials such as logwood, cochineal, marigold flowers, and cutch with gum arabic and alum. They used iron mordant powder to alter hues and create beautiful color shifts with citric acid. Participants left with a handmade botanical dye swatch book filled with dye samples.